We already knew the cast of It’s Always Sunny in Philadelphia was made up of a fantastic group of people – with Artemis obviously standing out as the most fabulous – but star Rob McElhenney restored some faith in humanity this week. Pennsylvania high schooler Aniya Wolf, a lesbian who is uncomfortable wearing girly clothes, was recently kicked out of her prom for not wearing a dress, as she’d instead chosen to wear a tuxedo. After catching wind of the incident, McElhenney reached out on social media and asked if Wolf wanted to wear the suit again, only not to a prom, but rather on his acclaimed FXX comedy. Huzzah! Rum hams for everyone! Well, except for the underaged Wolf, obviously. The school in question is the Catholic private school Bishop McDevitt, where Aniya Wolf had worn the school’s shirt and pants uniform for years. But according to ABC 27, there was a sudden change in procedure and a letter was sent out saying that it was mandatory for all girls to wear dresses to the prom. Wolf’s mother Carolyn called the school and tried to reason with them over the last-minute decision, given she’d already gone out and bought her daughter’s new suit specifically for the dance. There was no dice from Bishop McDevitt, but Wolf decided to go as she had originally intended, since she’d been anticipating it for quite a while. And then after being escorted out by a school official who threatened to call the police, Wolf left. The story attracted a lot of media attention, with some blaming the school for being discriminatory against a gay female and others blaming Wolf for not following the rules laid out by Bishop McDevitt. It’s pretty clear where Rob McElhenney lands on the issue, as he hit Wolf up on Twitter and asked her to wear the tux on It’s Always Sunny. And when she responded incredulously, he backed it up with a compliment and some details. Here’s the exchange. @AniyaWolf @abc27News I am not. We'll be in Philly the last week of June. We need a little extra style and class. Can you help us? As such, don’t be surprised when you turn on It’s Always Sunny in Philadelphia for Season 12, only to see a girl decked out in a tuxedo. And remember that it isn’t just for a goofy gag. 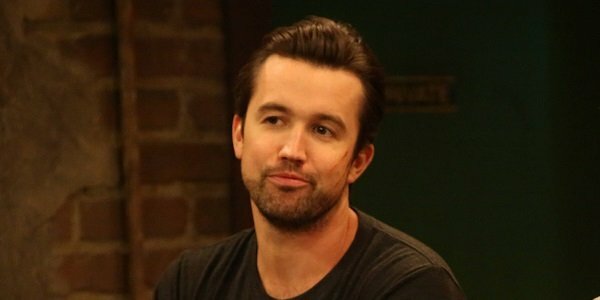 FXX recently gave fans an early Christmas present by renewing It’s Always Sunny in Philadelphia through Season 14, which will make it the longest –running live-action comedy in TV history. Keep at least ten Wednesday nights open for the next three years or so.